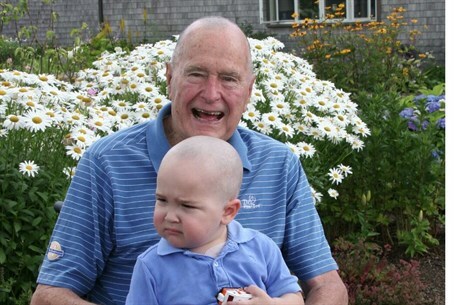 Former US President George H Bush showed a soft side Wednesday when he shaved his head in solidarity with a 2-year-old cancer patient. Former US President George H.W. Bush is known for many things – some good, some not – but Wednesday he showed a soft side when he shaved his head in solidarity with a young cancer patient. Patrick, the two-year-old son of a member of the secret service security detail for America’s 41st president, is being treated for leukemia. A photo was posted on the Twitter social networking site, showing the 89-year-old former president in his wheelchair holding the child on his lap – both sporting their shiny pates. “Beautiful,” commented Terry Moran of the ABC News Niteline program, who tweeted the photograph. All the members of Bush’s U.S. Secret Service Protective Detail – about two dozen men -- also shaved their heads in solidarity with Patrick and the former president. Bush and his wife Barbara lost their second child, 4-year-old daughter Robin, to the disease 60 years ago. According to a news release from Bush’s spokesperson, the former president and his wife have also made a donation to help pay for Patrick’s medical bills.